When you want nothing but the best high-performance parts for your Subaru, trust STI: Subaru Tecnica International. STI parts are built for performance and designed to fit your Subaru perfectly. We're proud to carry a selection of STI parts here at Capitol Subaru; when you're in need of performance parts for your next DIY project, we're the place to go. When you're looking for performance parts to improve your Subaru, come to Capitol Subaru, serving Keizer and Hayesville. Our parts store is stocked with not only genuine Subaru parts, chemicals, and accessories, but also a wide variety of STI performance parts. You can find all that you need for your DIY task--but if you'd rather let someone else handle the installation, you can always come by our state-of-the-art service center. And of course, we have the latest Subaru models on our lot, not far from West Salem and Four Corners. 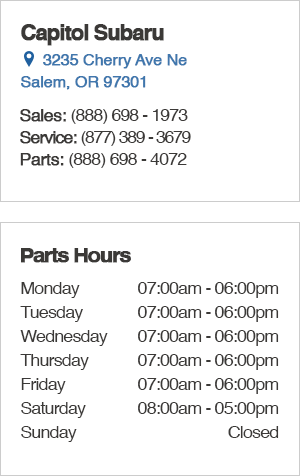 If you have any questions or would like to place an order, you can call us at (888) 698-4072; or, feel free to come browse our parts store at 3235 Cherry Ave NE, Salem, OR 97301. We look forward to seeing you!